Very nice! Miners of the Mountains of Mourn! They look great. Keep up the great work. I like them. Can't wait to see a whole unit, and then painted as well. That'd be awesome. Ya, for sure. I love looking at your conversions prior to painting,makes you appreciate them that much more. Oh yeah! Pre-painted AND painted FTW. Just, I if I see unpainted, I always want to see painted too. At the end of your beard how do you get the lines so thin and close together without making the beard flat? What do you call a 4 1/2 foot dwarf? What do you call a 4 1/2 foot Human? Gah, I thought for a moment this was a new post from snot. You need to use a very sharp blade, and it helps to wait until the GS is a bit harder. You shouldn't flatten it then. hey snot are you plaining any rocky stone baces? Love the shovels. It's quite the different concept and I can really "dig it"! 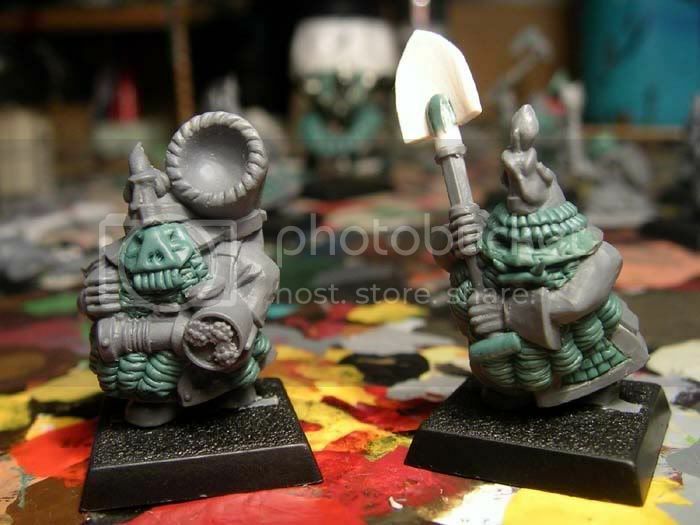 Nice minis, I especially like the guy wielding the shovel.